It may lack the cachet of jamming a tiny fish in your ear, but a new machine in development by Florida researchers may let us converse with dolphins. For nearly 15 years, Denise Herzing and her colleagues at the Florida-based Wild Dolphin Project have been attempting two-way communication with dolphins. While they've had success in teaching the animals to recognize commands (either in human language or using pictographic symbols), the biggest hurdle has always been in finding some way for the dolphins to respond. Previously, the best Herzing could do was a system in which the dolphins point their bodies at various symbols to make requests. While this is a form of communication, it's ultimately no more revelatory than a mouse that has been conditioned to press a button every time it wants a food pellet. Recently however, Herzing has joined forces with Thad Starner, an artificial intelligence researcher at the Georgia Institute of Technology, to build a system that would allow researchers and dolphins to "co-create" a language useful to both species. While the idea is theoretically sound, it brings with it a number of technical hurdles. Most crucially, if the system is to allow dolphins to communicate with humans in a manner natural to the animal, the system must be able to recognize and translate the system of communication dolphins use in the wild. 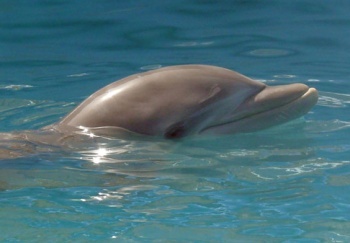 Since dolphin vocalizations can reach the 200 KHz range -- far beyond the normal audible range of a human being -- and the animals are capable of omnidirectional "speech" without actually moving their heads, Starner and his group of students have created a special waterproof mini-computer capable of intercepting the full range of dolphin "speech." The machine also includes a handheld Twiddler, a device that New Scientist describes as "a combination of mouse and keyboard," which will give researchers the ability to respond to their dolphin subjects with appropriate vocalizations of their own. The idea here is that this machine would allow researchers to match dolphin "speech" with the appropriate responses, in essence learning to speak to the animals in much the same way we learn to communicate with other humans during our formative years. Obviously this project is still in its nascent stages, but the concepts in practice all seem sound, and more crucially, the theoretical promise this idea holds is immense. The scientific potential of conversing with another species is unimaginable, and that's before you contemplate all the philosophical questions this entire thing would inherently raise. If nothing else, I have to assume dolphins would have some pretty scathing opinions on our modern oil drilling methods.